Opinion polls put Prime Minister Narendra Modi as favourite to win, but he faces a possible backlash from India's 900 million voters over unemployment and rural poverty. Because of India's vastness, Thursday marked just the first of seven phases in the election to take place from the tea plantations of Darjeeling to the slums of Mumbai to the tropical Andaman Islands, and everywhere in between. Security forces were on high alert due to the perennial danger of violence at election time, with five people including a local lawmaker killed in an ambush by suspected Maoist rebels this week. Online too, a war rages with social media awash with disinformation, fake news, trolls and bots in what is Facebook and WhatsApp's biggest market, where the world's cheapest data tariffs have fuelled a smartphone boom. Thousands of parties and candidates will run for office between now and May 19 in 543 constituencies across the nation of 1.3 billion people, with results not due until May 23. Some of the 1.1 million electronic voting machines will be transported through jungles and carried up mountains, including to a hamlet near the Chinese border with just one voter. Phase one on Thursday sees some 142 million people able to cast ballots. Polling stations in northeastern states like Arunachal Pradesh bordering China were the first to open, followed by parts of Bihar in the north - where women in multi-coloured saris queued - and Jammu and Kashmir in the Himalayas. 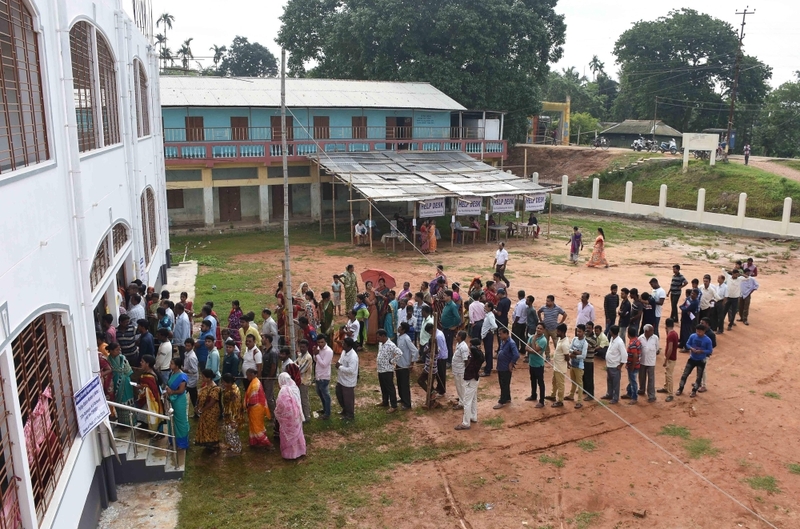 In Assam in the northeast, queues started forming 45 minutes before voting began, including many young people - there are 84 million first-time voters in this election - who were visibly excited. "It's a great feeling to cast the vote, which makes me a part of the democratic system and makes me responsible for electing a good leader who can run the country," Anurag Baruah, 23, told AFP. Modi appealed in an early-morning tweet to his almost 47 million followers on voters to "turn out in record numbers and exercise their franchise." Modi and his right-wing Bharatiya Janata Party (BJP) swept to power in 2014 with their famous promise of "achhe din" ("good days"), becoming the first party to win an absolute majority in 30 years. India's mammoth six-week general election kicked off on Thursday, with polling stations in the country's northeast among the first to open. The election is being held in seven phases between now and May 19, with Prime Minister Narendra Modi seeking a second term from the Asian giant's 900 million voters.